Nobody is retiring on $95,000, let alone $60,000 or $5,000. 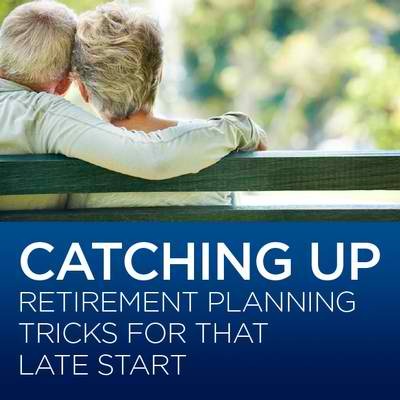 The good news is that even if you are late to the retirement savings game, there are ways to catch up. Max out all your resources. If you have a 401 (k) plan at work, immediately make the largest contributions possible. You may need to forget about that triple latte every day to make up for it, but it’s well worth it. Then see what you can squirrel away on your own by maxing out individual retirement savings plas. More help if you are over 50. When you reach age 50, the government gives you another path to help with your retirement savings. You may contribute up to an extra $6,000 per year in a tax-deferred retirement account. So you can add to your retirement savings and save even more on today’s taxes. You shouldn’t go it alone. Retirement catch up is important if you are late to the game. A professional planner can help guide you down the right paths. Together you can balance your current living situation, your retirement plans and the different savings plans that can fund your post-work life of leisure. Mr. Iacovazzi brings over 30 years of experience in the financial service industry. Don has extensive experience in building insurance/financial product sales enterprises with success increasing market share and sales in multi-million dollar divisions. He has a strong and successful history in insurance agency management and senior relationship/development roles. At the Prudential and Phoenix agencies he was an agency manager managing over 100 advisors and was the Senior Account/Relationship Manager at The Hartford working with the bank and wire house channels, with a focus on advanced sales concepts for the affluent/high-affluent clients. Don also worked as the Director of Product Sales for LIMRA International and has developed go-to-market programs in the Pre-Retiree/Retirement market for such firms as HSBC, Morgan Stanley, Bank of America, BlackRock, and UBS. Mr. Iacovazzi received his Bachelor of Science degree from the University of Central Connecticut in Business Administration/Marketing and holds a variety of insurance licenses. He is also a CEP, Certified Estate Planner, and a past Co-Chairman and instructor with AMTC – Agency Management Training Council.